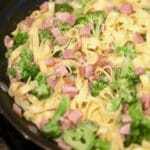 If you like Fettuccine Alfredo, you will love Easy Fettuccine Alfredo with Broccoli and Canadian Bacon! Number five in my Simple Summer Supper series, it’s an easy dinner recipe, the ultimate comfort food and you can have it on the table in 15 minutes. As good as it is, Fettuccine Alfredo isn’t something you can eat every night. Unfortunately, it’s loaded with calories and carbs, but every once in a while when you need a comforting bowl of pasta topped with a rich, creamy Alfredo sauce, this recipe fits the bill. 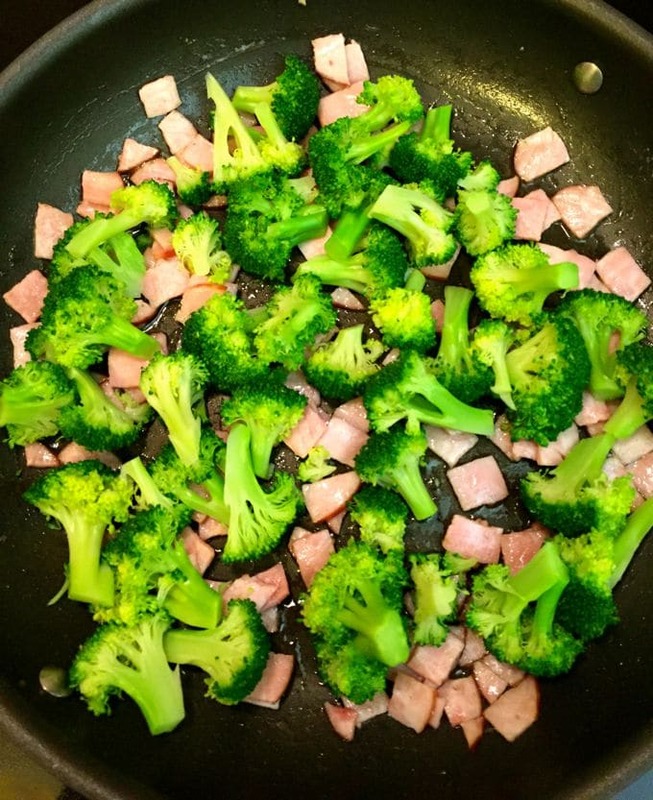 I’ve added some nutritious broccoli to this recipe and some yummy Canadian bacon to change things up a bit. 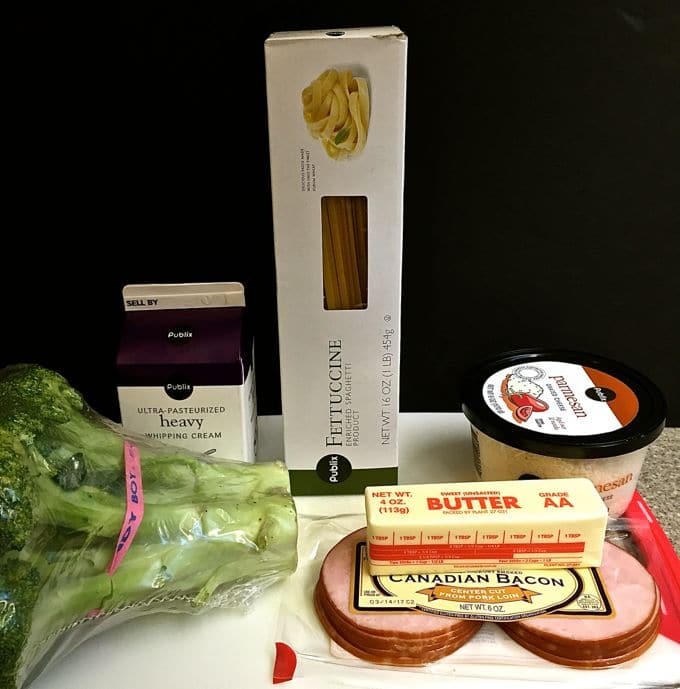 Or, you could replace the Canadian bacon with leftover ham and it would make a delicious leftover ham pasta recipe. I first made this easy fettuccine alfredo with broccoli over 20 years ago and took it to a potluck New Year’s Eve party. It was gone in a flash; everyone raved about it and all who ate it asked for the recipe. It’s that good! Easy Fettuccine Alfredo with Broccoli is one of my “go-to” recipes and once you try it, I know it will become one of yours too! If you have never made homemade alfredo sauce, you will be shocked to see just how quick and easy it is. And, after making it, you will be asking yourself why you have been using the jarred stuff. Melt butter in medium saucepan over medium/low heat. Add the cream and pepper and bring mixture to a simmer. Add the parmesan cheese and simmer a few minutes or until the sauce has thickened and the cheese has melted. 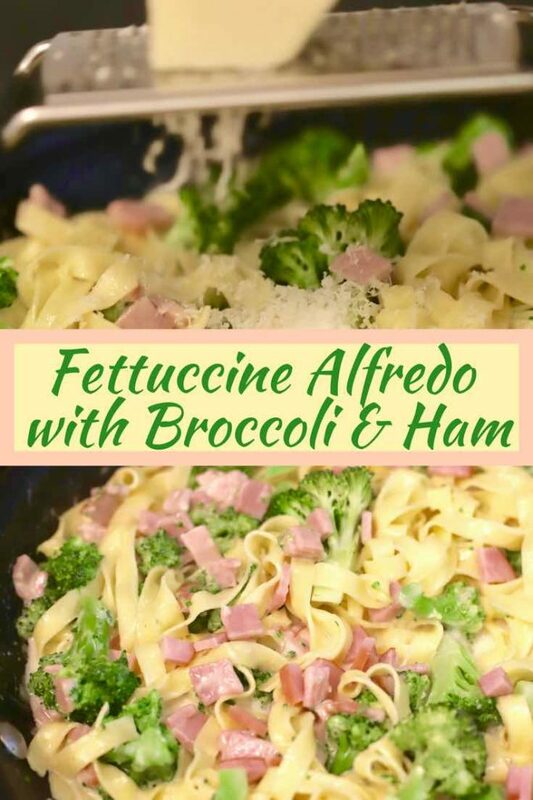 In this recipe for Fettuccine Alfredo with Broccoli, I have simplified the process even more and you basically just add the alfredo ingredients to the broccoli and ham mixture and stir until the cheese has melted, saving a step and an extra pan to wash. 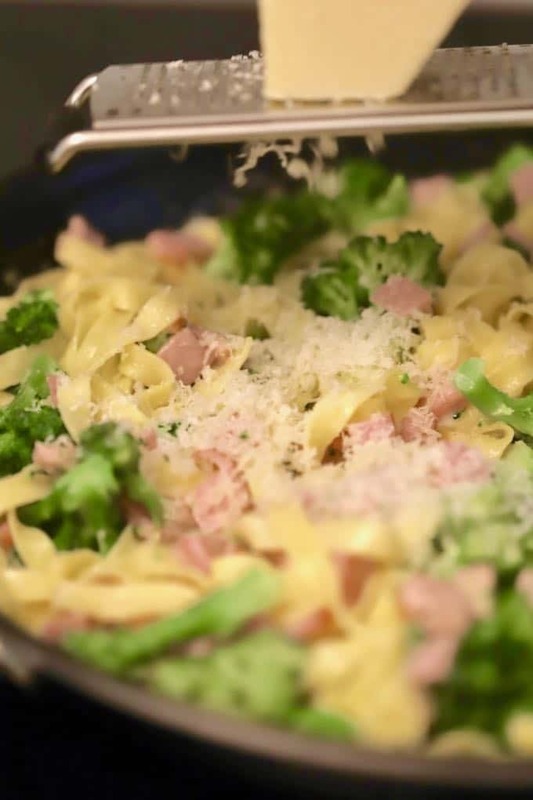 Gather your ingredients which are: fresh broccoli, dried or refrigerated fettuccine, butter, Canadian bacon or ham, heavy cream, freshly grated Parmesan cheese and ground black pepper. There are many ways to cook broccoli including roasting and cooking it in the microwave. 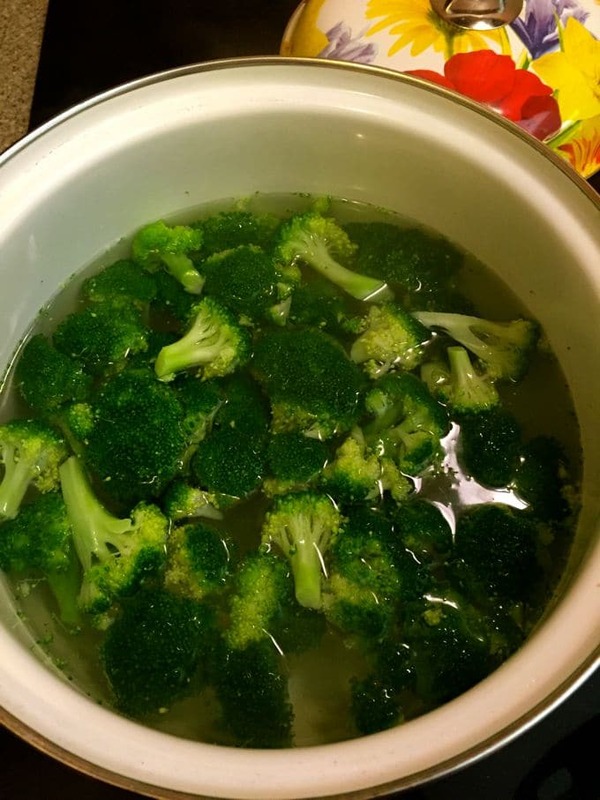 For this recipe, I simply added the broccoli to a large pot of boiling water over medium-high heat and cooked it three minutes. Then I removed the broccoli with a slotted spoon, drained it and set it aside. After cooking the broccoli, add the fettuccine to the same pot of boiling water and follow the package directions to cook it al-dente. Drain and set aside. Reusing the pan and water from the broccoli saves having to wash an extra pot and the broccoli water flavors the fettuccine. While the fettuccine is cooking, add butter to a large saute pan over medium-high heat. Add the Canadian bacon and saute for 2-3 minutes. Add the broccoli and reheat for 1 minute. To make the alfredo sauce, add the heavy cream, parmesan cheese, and pepper to the broccoli mixture and stir to combine. When the cheese has melted, add the fettuccine and toss until everything is combined. Grate fresh parmesan cheese over the top to serve. *This recipe was originally published on January 12, 2017. I have updated it and replaced several of the original pictures. If you make this recipe, please be sure to rate it and leave a comment below. I love hearing from you! Also, please follow me on Pinterest, Facebook, and Instagram. And finally, to be the first to receive notifications of new posts by email enter your email address here or in the Subscribe box. 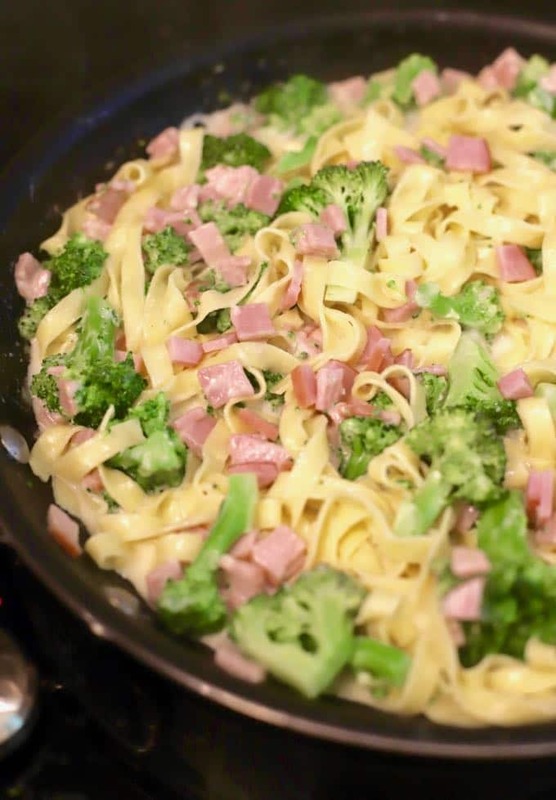 Easy Fettuccine Alfredo with Broccoli and Canadian Bacon is an easy dinner recipe and part of my Simple Summer Supper series. It's a kid-friendly meal that you can have on the table in just 15 minutes flat. 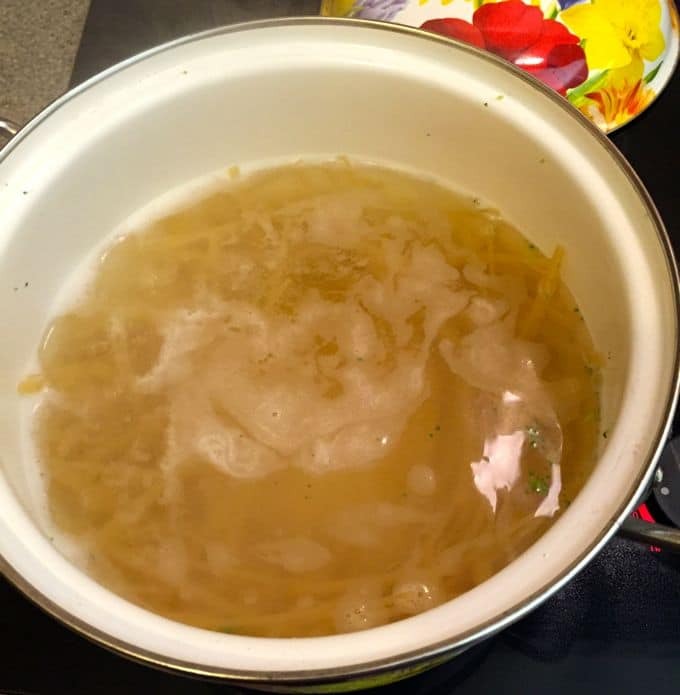 Place broccoli in a large pot of boiling water over medium-high heat. Cook three minutes and remove with a slotted spoon. Drain and set aside. While the fettuccine is cooking add the butter to a large saute pan over medium-high heat. Add the Canadian bacon and saute for 2-3 minutes. Add the broccoli and heat for 1 minute. Add the heavy cream, parmesan cheese, and pepper and combine. Add the fettuccine and toss until everything is combined. Serve immediately. Mmmm, fettuccini alfredo! It is comfort food and I do indulge in it occasionally. Now I have another reason to eat it. I must try this recipe! This sounds delicious, WEH won’t eat this but I’ll make it for myself, YUM!!!!! Thanks so much! This has been a family favorite for years! I know you would love it too!